What Is Gross Rental Yield And Why Is It Improtant? What Is Gross Rental Yield And Why Is It Improtant? Gross rental yield is the annual rent as a percentage of the purchase price or value of a property. But why is gross rental yield an important figure? What is gross rental yield and why is it important? Hi, I am Ryan from OnProperty.co.au, helping you find positive cash flow properties and a lot of investors want to know, What is the gross rental yield of a property I am investing in? They do these calculations to get a better understanding of the property. But what exactly is gross rental yield? Well, I am glad you asked. Gross rental yield is the annual income of a property as a percentage of the property’s value or purchase price. Now, if that does not make complete sense, do not worry, let me explain it to you. Gross rental yield, what you are doing is you are looking at the value of a property or you are looking at the purchase price of the property. So if you are an investor who owns a property, let us say you have owned it for 10 years, you might consider the value of that property because it has likely gone up in that time. If you are looking at purchasing a property then you are just considering the purchase price which is equal to the value of the property anyway. To get the gross rental yield, what you are going to do is look at the annual rental income of that property. So this is the weekly rent times by 52, and so what you do to get your gross rental yield calculation, you do weekly rent times by 52, divided by the purchase price or the property value. And this will give you a percentage because it is very rare that the rental income of the property will exceed its value. let me give you an example of gross rental yield. Let us say we have a property that is renting for $200 per week. This property is worth $100,000. To get gross rental yield, what we would do is take $200 times by 52 – because there are 52 weeks in a year, so this would give us $10,400. We then take that figure of $10,400; we divide it by the value of the property or $100,000. We get a 10.4% gross rental yield. It is called a gross rental yield because we are not looking at any of the expenses of the property like maintenance or vacancies or manager fees or anything like that. We are just looking at the baseline figures. So that is how you do the calculation. So why is gross rental yield important? And what do people use gross rental yield for? Well, gross rental yield is just one figure but it is very useful in understanding a property quickly. 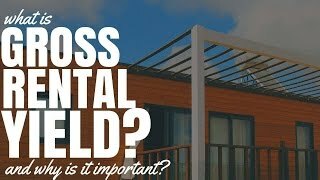 When you are out there and you are researching the market and looking at a lot of properties or maybe you are evaluating your portfolio, gross rental yield is a great figure to get an overview of how the rental income of your property compares to the value of your property and how likely it is going to generate a positive cash flow. So gross rental yield helps you understand properties quickly when you are looking at 100 different properties and you can see one has a 4% gross rental yield and one has a 10% gross rental yield. Which one is more likely to be positive cash flow? The 10% because you are getting more rental income compared to the value of that property. So it gives you the idea of the cash flow potential which is important especially if you want to invest in positive cash flow properties or you want to eventually generate a passive income from your portfolio in order to achieve financial freedom. It is also useful to see if your money can be invested better somewhere else. So let us say you own a portfolio and you are evaluating your portfolio. It has been 10 years and your property is going up in value but maybe rents have not gone up so much. You might have started with, let us say, 7% gross rental yield but because the property has gone up in value but rents have not quite risen the same, your gross rental yield is now 4% instead of 7%. You may now consider selling that property in order to purchase one or maybe two more properties that have a higher gross rental yield and put you in a better cash flow position. So what can happen over time is properties go up in value but rents do not go up as much meaning that your yield is becoming less and your cash flow therefore is not going to be working as hard as it potentially could so gross rental yield is a great figure to understand whether or not your money could be invested elsewhere. However, gross rental yield does have its limitations so let us talk about the limitations of gross rental yield. Firstly, it is just one figure. It is just one figure of many potential figures to look at in a property and it is a very basic figure. We are not looking at expenses. We are not looking at renovations. We are not looking at the structure of the property and all that sort of stuff. So it is just one figure. It can give us a good idea of certain things but we need to understand that this is just one figure; it is not a be all and end all of property investing. There are a lot of things that we need to do like suburb research, property research, make sure the property is not overvalued. We need to get structure people in to make sure that the property is in good condition, etcetera. So limitations of gross rental yield is that it does not teach you anything about the property, anything about the area or whether or not you should invest in it. It really is just a tool to compare a whole bunch of properties to each other. Another limitation of gross rental yield is that it does not correlate to capital growth. So just because a property has a high rental yield or just because it has a low rental yield does not mean that that is going to correlate to future capital growth for the area or future rental growth for the area as well. To look at that you really need to look at things like population growth; economics; you need to look at vacancy rates in the area and things like that. So it is not useful if you are searching for capital growth areas because it just does not seem to correlate. It does not show you your return on investment. Just because you are getting a 10% gross rental yield, that does not mean you are getting a 10% return on investment. In order to understand return on investment, you would need to do a cash on cash calculation so that is understanding how much cash did I put into this deal compared to what I borrowed from the bank; so how much cash of my own money did I put into this deal and how much positive cash flow am I getting back. What is the return on Investment on the cash that I invested? So you might want to do that calculation or maybe you want to look at investment based on the total money invested into the property whether you put that money in yourself or you formed a loan from a bank, what is your return on investment there. Thus gross rental yield is not going to give you that return on investment. It does not accurately predict cash flow. It is a useful tool to understand what is the cash flow of a property likely to be but it is not going to accurately predict cash flow because it is not taking into account things like manager fees, vacancy rates, council rates, insurance, all of these sort of expenses that come with owning a property. It does not take any of that into account so it is never going to accurately predict whether a property is going to be positive cash flow or whether a property is going to be negative cash flow or negatively geared. So if you want to easily work out what the cash flow of a property is going to be and what the cash on cash return of a property is going to be then I do have a tool for you. It is called Property Tools. It is a calculator that I created for myself to analyze property but it was so popular in the videos that I created that I turned around and made it available to you guys. Basically, the way that it works is super simple. You enter the purchase price of the property and you enter the rental income and then it spits out an estimated weekly and yearly cash flow of that property as well as an estimated cash on cash return. You can then go through and you can enter more details like vacancy rates, rental manager fees – you can change that into interest rates, all of these sorts of things to get a more accurate result on how this property is likely to perform. I have made it available to guys at a super affordable price starting at just $5. To check it out, go to PropertyTools.com.au, to get access to this cash flow calculator, to easily work out the rental yield of a property – it does that, it does gross rental yield; and also to work out the cash flow of a property and also to work out your cash on cash return. So if you are looking at multiple different properties or if you want to analyze you portfolio yourself, Property Tools will probably be super useful to you guys. Go to PropertyTools.com.au to check it out.